Procter & Gamble, in partnership with WEconnect International, has pledged to empower more women entrepreneurs. 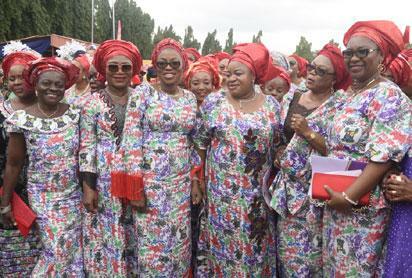 Wife of Lagos State Governor, Mrs. Bolanle Ambode (3rd left), with members of the Committee of Wives of Lagos State Officials (COWLSO) during the 2018 International Women’s Day Celebration, with the theme “Press for Progress’’, organized by the Lagos State Ministry of Women Affairs & Poverty Alleviation, at the Police College ground, Ikeja, on Thursday, 8 March, 2018. WEConnect International, is a global network that connects women-owned businesses to qualified buyers around the world. The announcement which coincides with the International Women’s Day was made at P&G’s corporate office in Lagos. WEDP aims to provide training on various technical aspects for growing business ventures, including skills and technical support required for females to succeed in the business environment. The program which is open to all women business owners in the WEConnect International Network, women-owned businesses and certified Women Business Entrepreneurs will take place in April this year across four weeks. The first edition of the WEDP, P&G successfully trained over 50 Nigerian women business entrepreneurs in collaboration with Accenture, Access Bank and British American Tobacco (BAT), on entrepreneurship fundamentals, human resource development. The post P&G, WEConnect to empower women entrepreneurs appeared first on Vanguard News.